What do Pete Townshend, Carlos Santana, and Tony Iommi all have in common? Back in the ’60s, each of these legendary guitarists played a Gibson SG Special with P-90 pickups—and made music history in the process. This beloved rocker has been re-introduced as the SG Special ’60s Tribute, in an instrument primed with the tone, versatility, and playability demanded by modern musicians. Since its arrival on the scene in 1961 (originally as the Les Paul/SG Special), Gibson’s dual-horned, double-cutaway SG has been an iconic rock axe, and has become known for solid performance and tonal versatility that is unparalleled in the guitar world. The Gibson SG Special 60s Tribute is based around the same revered tonewoods, glued-in neck, and Alnico-magnet P-90 pickups that made its predecessor legendary, with the same SlimTaper™ ’60s neck profile that is behind some of the fastest-playing guitars in history. Stripped-down and ready for business in your choice of Worn Cherry, Worn Natural, Worn Ebony or Worn White, the SG Special ’60s Tribute has the look and feel of a well-played friend right out of the gig bag, and comes in at a price that any hard working player can afford. Raw and Rockin’, a ’60s Icon Returns! The SG Special ’60s Tribute; a guitar that honors the beloved SG Specials of nearly 50 years ago It’s more than just a coincidence that mahogany is one of the most prized woods for electric guitar design, and the Gibson USA SG Special 60s Tribute is a classic example of the use of this fine tonewood in an instrument that’s both subtle and aggressive. 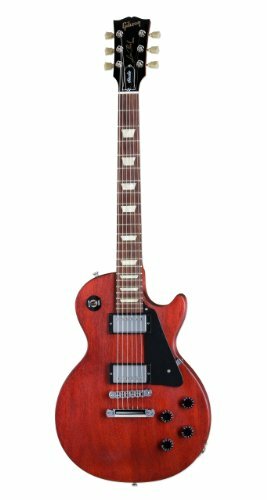 The thin solid-mahogany body offers a considerable reduction on weight when compared to many other solidbody electrics, while presenting a warm, rich resonance with lots of harmonic depth and sparkle. The guitar’s solid mahogany neck is carved to a slim profile similar to SGs from the 1960s, for superb in-the-hand comfort and outstanding playability, while it’s glued in deep-set, long-tenon neck/body joint and 17-degree back angled headstock team up to provide a transference of neck resonance into the body that’s far superior to other neck designs. Two Gibson P-90 single-coil pickups with genuine Alnico V magnets—some of the finest reproductions of vintage P-90s currently available—yield everything from warm, vocal neck tones to plenty of bark and snarl from the bridge position, with round and funky tones in between, all at the flip of a three-way toggle switch. To enhance all this tonal splendor, a stopbar tailpiece provides a rock-solid anchor behind Gibson’s legendary Tune-o-matic tailpiece, prized for its ability to enhance singing sustain while remaining highly adjustable to perfect your instrument’s intonation. At the other end of the neck, a PLEK-cut Corian nut ensures superior resonance and sustain. Wrap it all in a thin nitrocellulose finish in Worn Cherry, Worn Natural, Worn White or Worn Ebony, with the smaller early ’60s pickguard and pearloid dot fingerboard inlays, and it’s a guitar that looks as raw and meaty as it sounds. Your SG Special ’60s Tribute comes protected in a padded Gibson gigbag, and is covered by Gibson’s famous Limited Lifetime Warranty and 24/7/365 customer service. A solid mahogany body with beveled edges for added comfort and that distinctive “dual-horned” double-cutaway design are hallmarks of the legendary SG Special ’60s Tribute. The guitar’s select mahogany rings with all the depth and richness you’d expect from a classic tonewood, and looks great in your choice of aged nitrocellulose finish in Worn Cherry, Worn Natural, Worn White or Worn Ebony. Species The body of each SG Special ’60s Tribute is crafted from solid mahogany, one of the best-loved tonewoods in the history of the electric guitar. Mahogany not only offers classic resonant characteristics, but yields a lighter instrument than many other wood combinations. Tonal Characteristics Mahogany is a medium-dense wood with excellent resonance and superior sustain, and it offers a rich, round, warm tone, but with plenty of high-end sheen and good midrange presence. Design The SG Special ’60s Tribute follows the classic lines of the SG of the early and mid 1960s. It has a beveled body edge for increased comfort, and slightly asymmetrical dual horns on its double-cutaway body, that not only look distinctive but also provide outstanding access to the upper frets. Average Weight The average weight of a raw SG Special ’60s Tribute body is 4.03 lbs, which is in the normal range for a Gibson SG-style guitar, and lighter than an average solidbody guitar’s raw body. Surface Texture A hand-buffed, high-gloss finish with 90-sheen lacquer gives the SG Special ’60s Tribute a high-quality appearance in keeping with its heritage. Process The SG Special Faded is hand-finished in grain-textured nitrocellulose in a simplified process that results in a gently road-worn appearance. 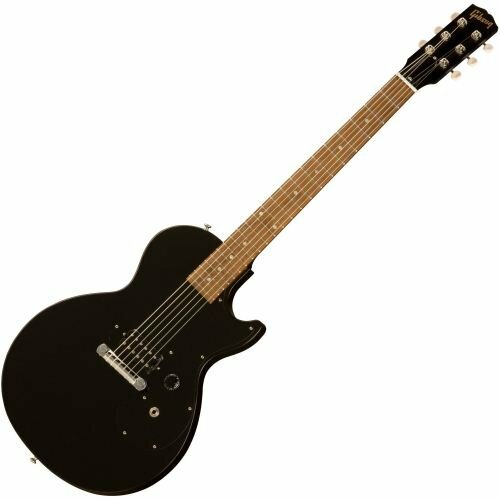 Unlike many other manufacturers, who settle for a polyurethane finish, Gibson opts for a nitrocellulose finish that will encourage the natural vibration of the instrument for a purer tone. In addition, a nitro finish is very porous and actually gets thinner over time, so your guitar will further age gracefully as you play it. A Mortis & Tenon joint binds the neck to body The SG Special ’60s Tribute is crafted in classic Gibson style with a glued-in neck made from solid quarter-sawn mahogany and topped with an unbound rosewood fingerboard. It has an angled headstock for superior resonance, and its SlimTaper™ ’60s profile and 1 11/16″ wide Corian nut help to make it supremely playable. Neck Species The neck of the SG Special ’60s Tribute is constructed from solid mahogany, cut using the superior “quarter sawn” orientation for improved strength and resonance. Neck Profile The neck on the SG Special ’60s Tribute is carved to the popular SlimTaper™ profile for a great combination of speed and comfort, with a thickness of .800″ at the 1st fret and .875″ at the 12th. Tonal Characteristics The angled, classical-style peg head and mahogany neck work together to provide exceptional tonal richness and resonance from the neck, with a good string definition and sustain. Gibson’s traditional 17 degree headstock angle Tolerance When fitting the neck and body together, we take advantage of our precise measuring equipment so that all angles, pitches and alignments maintain a tolerance within .005 of an inch. Not only does this help to keep your guitar in tune but it also maintains proper string alignment relative to the fingerboard. Joint Gibson uses what is known as the Mortis & Tenon joint to bind neck to body so that the two pieces form one solid unit. On the Gibson USA SG Special ’60s Tribute this includes the larger tenon employed in earlier SGs, which helps to maximize sustain. Headstock Angle The SG Special ’60s Tribute headstock is carefully angled at Gibson’s traditional 17 degrees, which increases pressure on the strings and helps them stay in the nut slots. An increase in string pressure also means there is no loss of string vibration between the nut and the tuners, which equals better sustain. Truss Rod Gibson’s traditional truss rod, found in most all of our guitars, is highly responsive to the individual adjustments you’ll want to make to personalize and optimize string action and sustain. Logo The Gibson logo — one of the most globally recognized logos of all time — is silkscreened in gold across the top of the guitar’s headstock. Rosewood is the traditional fingerboard species of the original SG Special Fingerboard Species The neck of the SG Special ’60s Tribute carries a rosewood fingerboard, the traditional fingerboard of the original SG Special ’60s Tribute. Rosewood is both hardwearing and sonically superlative, adding sweetness and depth to the guitar’s overall sound. Frets The SG Special ’60s Tribute sports 22 medium-jumbo frets, all immaculately dressed and polished. 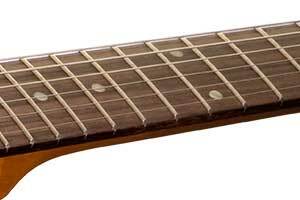 Tonal Characteristics Rosewood fingerboards are known for their rich, round tone. Radius The 12-inch radius of the SG Special ’60s Tribute fingerboard provides smooth note bending capabilities and eliminates “dead” or “choked out” notes, common occurrences on fingerboards with lesser radiuses. Inlays The SG Special ’60s Tribute fingerboard carries acrylic dot position-marker inlays. 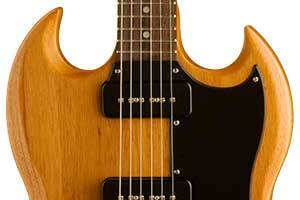 Nut Material The nut on the SG Special ’60s Tribute is made from Corian, which is mainly composed of acrylic polymer. This popular synthetic alternative to bone offers a very durable material, delivers enhanced sustain, and holds the tolerances of the precision cuts made in the slotting process. It is installed into the top surface of the neck, butting up to the end of the fingerboard to ensure proper tone and sustain transfer, and its nut slots are cut with Gibson’s PLEK system to ensure precise fit, break angle, and string spacing. Nut Width The width of the nut on the SG Special ’60s Tribute is approximately 1 11/16″, the traditional nut width of Gibson electric guitars. Two Gibson P-90 single-coil pickups with genuine Alnico V magnets, just like on the original SG Special, yield everything from warm, vocal neck tones to plenty of bark and snarl from the bridge position, with round and funky tones in between. 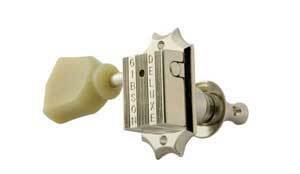 They are routed through the classic Gibson four-knob and three-way switch control section. Pickups Model Gibson’s P-90 “soapbar” is a vintage-style single-coil pickup that has long been a favorite of rock and blues players. 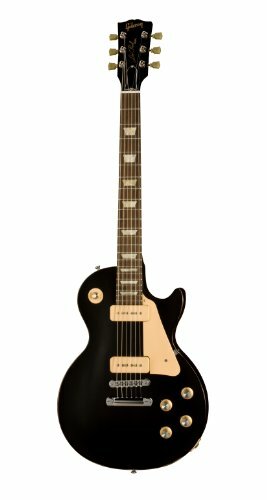 Among the most accurate P-90 reproductions available today, Gibson USA’s P-90 is made with two genuine Alnico V bar magnets in each pickup and wound with authentic 42 AWG plain enamel-coated wire, to authentically reproduce those thick, snarly, slightly grainy rock’n’roll tones of the ’50s and ’60s. Magnet Material Alnico V bar magnets. Tonal Characteristics The dual P-90 pickups in the SG Special ’60s Tribute offer down-to-business sounds from subtle to aggressive, which are capable of raw rock’n’roll and singing blues, yet surprisingly versatile, too. These pickups are characterized by everything from warm, vocal neck tones to plenty of bark and snarl from the bridge position, with round and funky tones in between, all with that distinctive bite and slightly gritty edge that is characteristic of this classic fat single-coil pickup. Gibson’s P-90 pickups use Alnico V magnets for a rich, warm response with plenty of bite. Volume Controls The SG Special ’60s Tribute uses an individual volume control for each pickup, which consists of a quality 300k linear potentiometer for a smooth, natural volume roll-off. Tone Controls The SG Special ’60s Tribute features individual tone controls for each pickup, comprised of 500k non-linear potentiometers with.022µF tone capacitors for a smooth transition from bright to warm. 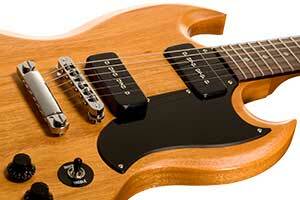 Toggle Switch The SG Special ’60s Tribute features one three-way Switchcraft toggle switch. In the down position, only the bridge pickup is active. In the middle position, both pickups are active. 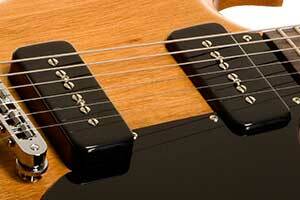 In the up position, only the neck pickup is active. Output Jack The guitar features a 1/4″ output jack made by Switchcraft. 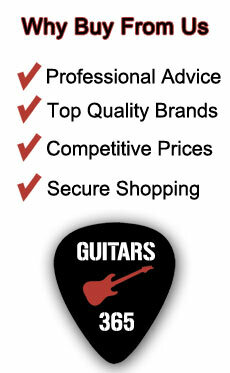 Its super heavy duty construction holds your guitar cable securely in place. The hardware set on the SG Special ’60s Tribute echoes that worn by several classic SGs since the 1960s, and includes Gibson’s hallowed Tune-o-matic bridge, stopbar tailpiece, and vintage-style tuners. A classic of 20th century guitar design, the Tune-o-matic provides excellent resonant coupling, while offering efficient independent adjustment of each saddle for precise intonation. The Gibson SG Special 60’s Tribute’s Tune-o-matic bridge, stopbar tailpiece, and vintage tuners offer classic style and solid performance. vintage-style tuners with green tulip buttons and an efficient 14:1 turn ratio. Tuning Keys The headstock of the SG Special ’60s Tribute is equipped with vintage-style tuners with green tulip buttons and an efficient 14:1 turn ratio. 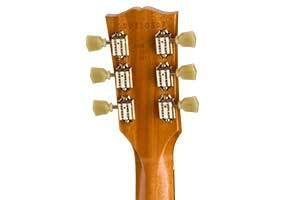 These tuners provide a classic look in line with the model’s lineage, and smooth, robust performance. Trussrod Cover As with most Gibson guitars, the truss rod cover on the SG Special ’60s Tribute is made from black and white vinyl plastic and shaped like an antique bell. Strap Buttons The SG Special ’60s Tribute’s aluminum strap buttons are the same style and design that Gibson has used since the early 1950s. Pickguard The SG Special ’60s Tribute carries a single-ply black pickguard in the smaller style of SGs from the early to mid ’60s. Bridge In 1954, Gibson revolutionized guitar hardware when it debuted the Tune-o-matic bridge, setting a standard for simplicity and functionality that has never been bettered. Included on the SG Special ’60s Tribute, the Tune-o-matic provides a firm seating for the strings, allowing the player to adjust and fine-tune the intonation and string height in a matter of minutes. It also yields excellent coupling between strings and body, maximizing resonance, tone, and sustain. This bridge is made from Zamak then plated in chrome, and each one weighs approximately .118 lbs. 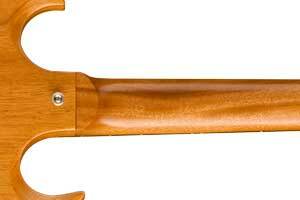 Tailpiece Every Tune-o-matic bridge is combined with a separate “stopbar” tailpiece, which is essentially a modified version of the earlier wraparound bridge that’s designed to further enhance the connection between the strings and the body. The SG Special ’60s Tribute’s stopbar tailpiece is made from Zamak then plated in chrome, and each one weighs approximately .24 lbs. Control Knobs The control knobs on the SG Special ’60s Tribute are Gibson’s black top-hat knobs, as found on many vintage and modern Gibson guitars. Strings The SG Special ’60s Tribute is fitted with genuine Gibson strings, sizes .010 – .046. Gibson Gig Bag Case complete with plush lining. 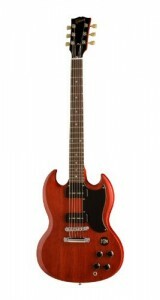 All in all, the Gibson SG Special 60’s Tribute Electric Guitar is a unique instrument.